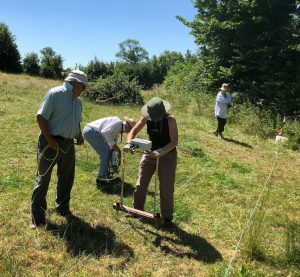 Archaeology: Geophysical Surveying Training Day at Chapel AllertonOn Saturday 30th June SANHS held its first geophysical surveying training day with the help of members of the South Somerset Archaeological Research Group (SSARG) and GeoFlo Southwest Geophysical Services. 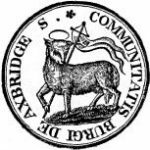 The event took place at Chapel Allerton and participants included members of the Axbridge and Chapel Allerton Local History Societies. The field chosen for the survey is located opposite the church and has a lot of potential for interesting results. There are several linear earthworks which are clearly visible, including what appears to be a rectilinear enclosure. Historically the field used to be the site of the Village Fair, plus there was a trackway through it which led to the local mill.This Summer has been a scorcher and 30th June was no exception! 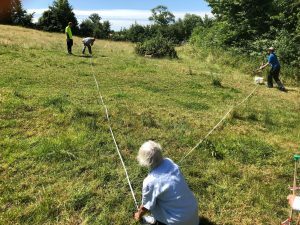 Nine hardy volunteers braved the heat to try their hand at resistivity and gradiometry surveying. Unfortunately, despite the hot weather, the grass was too long in the part of the field that we really wanted to survey, plus there were cattle roaming around, so instead we chose a small 20 x 80m strip between the road and a small copse of trees in the middle of the field. The volunteers were instructed in how to set up the survey grid, and then had the opportunity to use the resistivity meter and gradiometer. We managed to survey the area completely with both machines and then retired to the relative coolness of the church to have a look at the results. Unfortunately the gradiometer results were severely affected by ferrous magnetic disturbance, but the resistivity results revealed some irregular linear anomalies of varying strength and alignment. 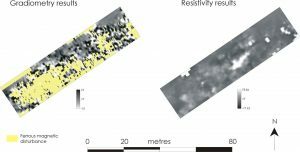 It is possible that some of these could be associated with a former building, and if so it is also possible that some of the disturbance in the gradiometer results could be due to demolition rubble. The rest of the field is due to be surveyed this Autumn after the grass has been cut and the cows are indoors, and volunteers from the training day have been invited to come along. I would like to take this opportunity to thank everyone who helped out on such a hot day, and especially for arranging access to the church and providing drinks and biscuits and cake! Ed: AALHS and the Allerton History Society are grateful to SANHS and the grant from the Maltwood Fund for financing this project.